Cassava chips are pieces of dried, sliced or chipped roots not exceeding 6cm length with starch content of 70% or more. 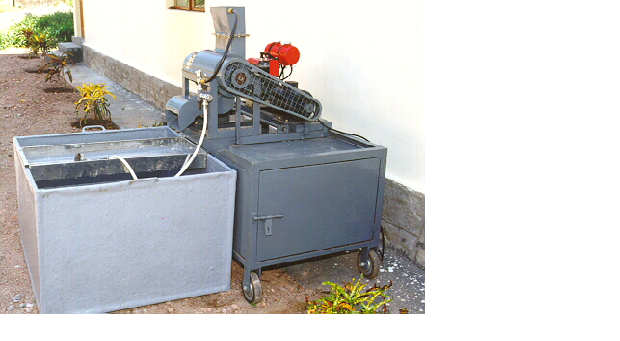 The cassava chipping machine is a machinery used to slice the cassava tuber into chips of various thickness and shape. 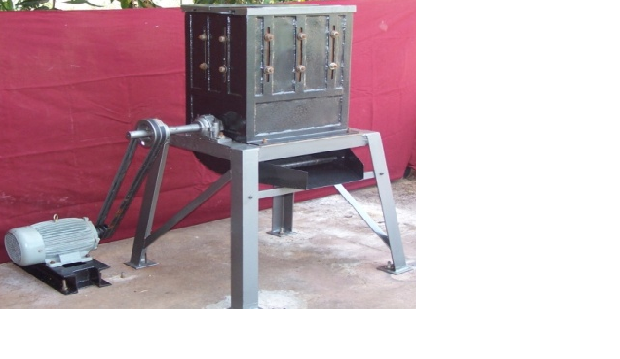 ICAR-CTCRI has developed three types of cassava chipping machines. Hand operated chipping machine consists of two concentric mild steel drums, the annular space between which is divided into compartments for feeding the tubers, supported on four MS legs. A rotating disc at the bottom of the drum carries the knives assembly. A pair of HSS bevel gears is provided to operate the machine manually with a crank arm. Tubers are fed into the compartments from the top and the chips are collected at the bottom .Capital cost of the machine is approximately Rs 17850/-. The pedal operated chipping machine is the modified version of the hand operated prototype with additional provision of a pivoted pedal for transmitting the power to the cutting disc through suitable belt and pulley drive mechanism. A trimming knife is also provided on the frame to remove the woody neck portion of the tubers before feeding into the compartments. Four castor wheels are fixed to the legs of the machine to make it portable. Cost is approximately Rs 25000/-. The motorized chipper developed is run with a 0.5 HP single phase motor through suitable belt drive. The feed hopper consists of two concentric rows of 25 cm high ms cylinders. The outer row of cylinders is of 10 cm diameter while the inner row of cylinders meant for thinner tubers are of 7 cm diameter. A MS circular disc of 87 cm diameter and 10 mm thickness carries two pairs of stainless steel blades. The mobile starch extraction plant is cost effective equipment permitting on-farm starch extraction by the producers and thus avoids the exploitation of the farmers by middlemen. The major components of the machine are hopper to feed the tubers, crushing disc or cylinder with nail punched protrusions rotating inside crushing chamber to crush the tubers, sieving tray to remove the fibrous and other cellulosic materials, stainless steel or plastic tanks to collect the sieved starch suspension, tuber storage chamber, handle and wheels for easy transportation from place to place and a frame to support these components. An electric motor (¾ HP) or a generator (kerosene–petrol) attached to the frame can be used as the energy source to operate the machine. The size of the equipment is 1350 x 1800 x 1320 mm and the capacity of the machine is 120-200 kg h-1. 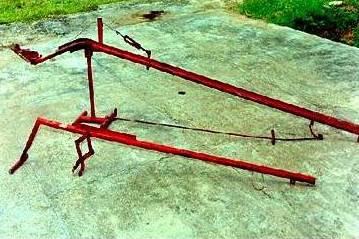 The rasper consists of a crushing drum made up of a mild steel pipe with power hacksaw blades fixed on its circumference. The crushing drum is fixed on a shaft, power to which is provided by anelectric motor with belt and pulley. The drum is rotated inside the crushing chamber which is made up of two halves, the upper being act as hopper and the bottom half portion acts as outlet for the crushed mash to flow. Gap between the blade set and crushing chamber is adjusted to minimum. A changeable sieve plate is provided in the bottom half to filter the starch pulp with out any bigger pieces. Capacity machine ranged from 800 to 1000 kg h-1. Two level type harvesting tools have been developed in CTCRI. Only 14-15 mandays are required to harvest one hectare of cassava whereas 30-34 mandays are necessary for manual operation. These low cost mechanical devices reduce the drudgery involved with the manual harvesting. a. First order lever type: The lever is supported on a fulcrum, which in turn is supported at the top of a stand. During the operation, the jaws open just enough to get around the cassava stem. It has a mechanical advantage of four and its weight is 14 Kg. It costs approximately Rs.2500/- b. Second order lever type: The height of the fulcrum at the far end of the lever can be adjusted which facilitates uprooting of cassava plants raised on flat bed as well as on mounds or ridges. A self tightening mechanism is used to grip the cassava stem. It has a mechanical advantage of 3.4 and the total weight is 8 Kg. It costs approximately Rs. 1800/-.